It was a hallmark of the former first lady’s work. Nonetheless, the fate of Michelle Obama's campaign called “Let Girls Learn," which sought to educate girls around the world, is unclear. According to an internal document obtrained by CNN, the program is being folded. The White House, however, denies that is the case. The former first lady also held events in Washington with girls from around the United States as well as video-conference conversations with girls in classrooms all over the world in which she emphasized how important education was to her success. The program helped achieve two of the Global Goals — education and gender equality. Obama was inspired to create the program after meeting with Malala Yousafzai in the Oval Office in 2013, according to the Washington Post. The new change was not announced by the White House, but was leaked in an internal email sent by the head of the Peace Corps, acting director Sheila Crowley, to employees. The Peace Corps and USAID supported the campaign’s international programs. Hours after the CNN report surfaced, the State Department sent two tweets on the topic. ". @statedeptspox: There have been no changes to the #LetGirlsLearn program. We are committed to empowering women and girls around the world," the first tweet stated. Another tweet followed, "@WhiteHouse supports policies & programs to empower and educate adolescent girls. 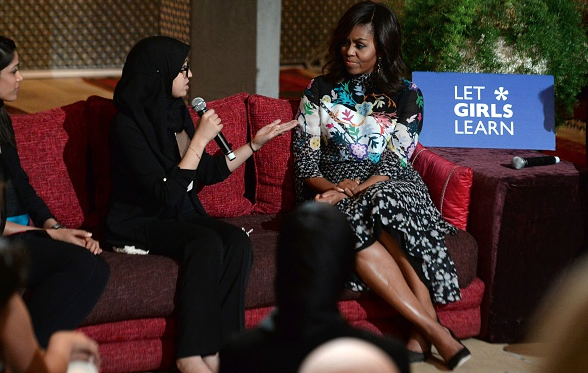 #LetGirlsLearn"
Some of the programming that was part of the Let Girls Learn campaign will continue, according to CNN. The administration is specifically removing the branding of the campaign that is closely associated with the previous administration, but has not announced any changes in its plan to fund overseas education for girls. "Moving forward, we will not continue to use the 'Let Girls Learn' brand or maintain a stand-alone program," Crowley wrote in the email. "We are so proud of what 'Let Girls Learn' accomplished and we have all of you to thank for this success." But Crowley emphasized that the Peace Corps would continue to prioritize girls education, as it has for the past half-century. "We remain dedicated to the passionate work of our volunteers and staff to empower and educate girls in their communities," she said. Questions about the details of the change were referred by the White House to first lady Melania Trump, who declined to comment, according to CNN.